Newspapers contain a great deal of information concerning local events, and state and national events that were instrumental in shaping lives. Information concerning the social and cultural history, economics, politics, and individualism of members of the community can be found. City and county commission minutes and other official records were printed in the newspaper. Advertisements provide information concerning businesses that were a part of the community. Biases in reporting and information in articles indicate civic attitudes. Editorials outline positions on more controversial issues of the day. Starting in the 1950s, newspapers posted birth and marriage announcements and death notices and obituaries. The State Historical Society of North Dakota has the best collection of historic newspapers at the Heritage Center on the State Capitol grounds in Bismarck. Although SHSND materials generally do not circulate, most newspapers are available on microfilm through interlibrary loan. Efforts are underway to convert files to digital format. Mandan's first newspaper, the Mandan Criterion, was first published on May 24, 1879. Harry Robinson, originally from Wisconsin, arrived into town on May 16, 1879 bringing his printing equipment with him and quickly opened his print shop. His paper was the official Morton County newspaper until a new upstart competitor, The Mandan Pioneer, started operations on October 1881 and replaced the Criterion as official county newspaper in January 1882. Robinson remained in the area until at least June 1887. 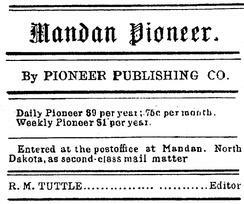 The Mandan Pioneer weekly newspaper was started on October 1, 1881, the same year the city of Mandan was incorporated. Initially owned by F.H. Ertel (previously from Jamestown) and former publisher of the St. Paul Daily Hotel Reporter; and part-owner of the St. Louis (MO) Daily Dispatch; and Herbert H. Gove (originally from Rochester, Minnesota). Gove would quickly sell out his interest and move to the West Coast. Ertel sold the paper to R. M. Tuttle and Charles Wilson in 1883. In August 1883, the partners incorporated the paper's operation and took on several prominate local businessmen as stockholders. Shareholders included the Marquis de Mores, Michael Lang, Joseph Miller, A.C. Macrorie, George Bingenheimer and F.H. Ertel as well as Tuttle and Wilson. In 1884, R.M. Tuttle purchased Ertel's share and under his leadership the paper's circulation grew. However in December 1897, as reported in their own paper, Tuttle was reportedly overworked sold part of the Pioneer to W. C. Gilbreath. Gilbreath bought out Tuttle when the latter left town to join Dr. Coe in Oregon to become his hospital administrator. W. C Gilbreath would publish the paper until the group sold their interest in the paper in about 1896 to W. Harry Spears. In 1909, Edwin (E. A.) Tostevin bought the paper. The printshop was originally located at 110 2nd Ave NW but relocated to West Main Street to the east space in the Cary Building in Block 9 (and would later become to be known as the Pioneer Block) where it remained until 1910. By 1909, its circulation was larger than all the other papers in Morton County, combined. Tostevin would move it into larger quarters in the basement of the Hotel Mandan on the northeast corner of Collins Avenue and Main Street. The paper continued as a weekly until April of 1914 when it became a daily paper and redubbed the Mandan Daily Pioneer. Lively, local political campaigns for state and county offices and the outbreak of WWI ensured the necessity for a daily paper and the circulation almost doubled in a short time. The Mandan Daily Pioneer was an influential paper serving the Western Slope area. A second generation of the Tostevin family continued operations and ended a its 54-year ownership of the paper until sold to Pioneer, Inc. in April 1963. The new corporation formed by the Conrad brothers, Currie, John G., Charles O. and E.J., all of Bismarck, and William F. McClelland, Mandan. The paper would subsequently be published from a brand new facility on east Memorial Highway southeast of current DaWise-Perry funeral home/former Gourmet House. The publication was renamed the Morning Pioneer. Eventually the Conrad brothers bought out their business partners, and published it under the Conrad Publishing moniker. As society moved to getting its news from television rather than the print media, readership fell dramatically and the consolitation in the newspaper industry was in full swing by the 1980s. Lee Enterprises eventually purchased the Pioneer and merged it into the Bismarck Tribune's circulation. Until that time, it had achieved the notarity of being North Dakota's fourth oldest newspaper. Conrad also published The Mandan News from a location at 414 West Main St. In 1975, John F. Maher and his family took over the Mandan News, which continues today as a Lee Enterprises operation. The Mandan Times was started as a weekly newspaper published on Saturdays starting on July 1, 1882 by J. E. Cates. A. M. Packard, described by an 1884 issue of the Mandan Pioneer as an experienced Chicago-area journalist, started the first newspaper in Medora/Little Missouri in Billings County called The Bad Lands Cowboy. However he would later appear in Mandan to take over the operation of the The Mandan Times. The Mandan Times was published out of a space on Livingston Avenue (now Third Avenue NE) between Main and First Streets, offered weekly news and promotions to residents. It was the official paper of both the City of Mandan and Morton County in 1898. The Mandan Times was started by Albert Merton Packard, who would typically be referred to as A. M. Packard. Packard came to Mandan in 1888 with his wife from Iowa where he was born in 1859. He would serve the community as a member of the state legistlature as well as Morton County's Register of Deeds for 10 years. Parckard also served as Mandan's mayor (i.e. President of the City Commission) from 1909 to 1912. He died in 1913 in Mandan at the age of 54. The Mandan Times was purchased by Smith Abraham Young in about 1904. Young was originally from Cairo, IL. He moved to Mandan from Flandreau SD where he was an apprentice printer. He would later purchase the Mandan Republican and would be the State Printer for three sessions. The Mandan Republican was published from its location at 422 West Main St with Smith Abraham Young a publisher. 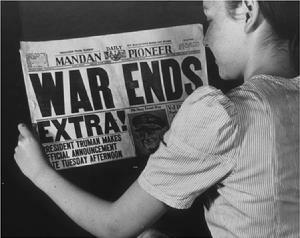 Its circulation peaked in the early 1920s when Mandan supported five newspapers. Young also operated Young's Printery and then launched the Morton County News, a weekly newpaper as a continuation of the Flasher Tribune. His son Roy joined him in the business in 1933 and continued the operation after the accidental death of is father in October 1937 at his home over their print shop then at 107 4th Ave NW. Morton County and Mandan News editor Peg Nelson has resigned in 2000 after a four-year career with the newspaper and other Lee Enterprises publications. Nelson became editor after the resignation of general manager Ken Elias in 1998.